جوان نژاد, رضا, مشکواتی, امیرحسین, قادر, سرمد, احمدی گیوی, فرهنگ. (777). حل عددی شکل پایستار معادلات تراکمپذیر دوبعدی و ناآب‌ایستایی جوّ با روش فشرده مککورمک. مجله ژئوفیزیک ایران, 10(1), 28-46. رضا جوان نژاد; امیرحسین مشکواتی; سرمد قادر; فرهنگ احمدی گیوی. "حل عددی شکل پایستار معادلات تراکمپذیر دوبعدی و ناآب‌ایستایی جوّ با روش فشرده مککورمک". 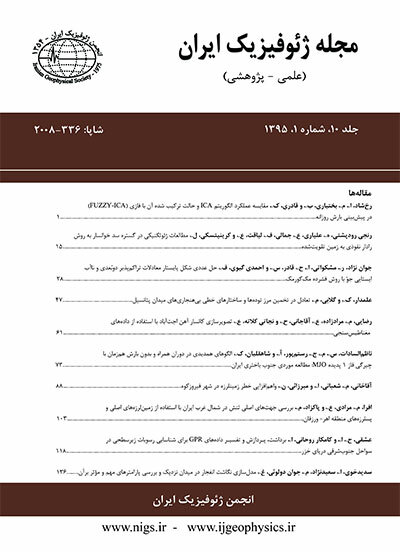 مجله ژئوفیزیک ایران, 10, 1, 777, 28-46. جوان نژاد, رضا, مشکواتی, امیرحسین, قادر, سرمد, احمدی گیوی, فرهنگ. (777). 'حل عددی شکل پایستار معادلات تراکمپذیر دوبعدی و ناآب‌ایستایی جوّ با روش فشرده مککورمک', مجله ژئوفیزیک ایران, 10(1), pp. 28-46. جوان نژاد, رضا, مشکواتی, امیرحسین, قادر, سرمد, احمدی گیوی, فرهنگ. حل عددی شکل پایستار معادلات تراکمپذیر دوبعدی و ناآب‌ایستایی جوّ با روش فشرده مککورمک. مجله ژئوفیزیک ایران, 777; 10(1): 28-46. یکی از زمینه‌های پژوهشی مورد توجه در ارتباط با حل عددی معادلات حاکم بر جو، افزایش دقت عددی شبیه‌سازی‌ها می‌‌باشد. در این پژوهش روش مککورمک فشرده مرتبه چهارم با پیشروی زمانی رنگ-کوتا مورد توجه قرارگرفته است. روش مککورمک فشرده مرتبه چهارم با پیشروی زمانی رنگ-کوتای چهارمرحله‌ای برای حل عددی معادلات تراکم‌پذیر دوبعدی و ناآب‌ایستایی جو مورداستفاده قرارگرفته و نتایج آن با روش‌های مککورمک مرتبه دوم و مککورمک فشرده مرتبه چهارم با پیشروی زمانی مرتبه دوم مقایسه شده است. برای انجام این مقایسه، از آزمون موردی حباب سرد و حباب گرم در جو خنثی استفاده شده است. بررسی پریشیدگی دمای بالقوه (پتانسیلی)، پریشیدگی سرعت قائم و افقی، پریشیدگی فشار و بررسی میزان همگرایی حل عددی، موقعیت لبه جلویی جبهه در این روش‌ها و مقایسه آن‌ها با توجه به فواصل مختلف شبکه‌ای نشان داد، استفاده از روش مککورمک فشرده مرتبه چهارم با پیشروی زمانی رنگ-کوتای چهارمرحله‌ای در حل عددی نسبت به دو روش دیگر مورد مطالعه برای معادلات تراکم‌پذیر دوبعدی و ناآب‌ایستایی جو منجر به بهبود جواب‌ها می‌شود. Increasing the accuracy of numerical methods used for simulation of fluid dynamics problems, particularly the geophysical fluid dynamics problems (atmospheric and oceanic), has been the subject of many research works. Recently, due to the increasing computing power of computers, the advantage of high-resolution numerical methods for numerical simulation of the governing equations of fluid flow is further emphasized. The idea of compact finite difference methods goes back to some works conducted in 1920s and 1940s. However, the pioneering works of Kreiss and Oliger (1972), Hirsh (1975) and Lele (1992) made these methdos popular and showd that compact finite difference methdos can be used as a powerful tool for numerical simulation of fluid dynamics problems appearing in different branches of science. These methods have also been used in numerical simulation of geophysical fluid dynamics problems. Due to the promising performance of compact finite difference methods, application of these schemes to numerical simulations of atmospheric and oceanic flows has increased. The compact finite difference schemes have shown that are able to provide a simple way to reach one of the main objectives in the development of numerical algorithms, i.e., having in our disposal a low-cost and highly-accurate computational method. The compact methods have been used extensively for numerical solution of various fluid dynamics problems. These methods have also been applied to numerical solution of some prototype geophysical fluid dynamics problems (e.g., shallow water equations). Most of the compact finite difference methods are symmetric (usually with a 3- or 5-point stencil) and finding each derivative requires a matrix inversion. Recently, a new class of highly-accurate explicit MacCormack-type methods has been introduced for computational fluid dynamic. The compact MacCormack-type methods were developed by Hixon and Turkel (2000) to split the derivative operator of the central compact method into two one-sided forward and backward operators. This study is devoted to application of the fourth-order compact MacCormack method for numerical solution of the conservative form of two-dimensional non-hydrostatic and fully compressible Navier-Stokes equations governing an inviscid and adiabatic atmosphere. Moreover, the second-order MacCormack method is used to compare the performance of the computations. This enables us to measure some aspects of the computational results (such as efficiency and accuracy). Various aspects of the computations such as discretization of the equations for the interior and boundary points, the details of implementation of boundary conditions for different boundary types (e.g., rigid and open boundaries), time step, grid resolution and dissipation are presented. Since, unlike the second-order MacCormack method, the forward operator in the fourth-order compact MacCormack method for approximation of the first derivative at an arbitrary grid point (e.g, j) is not equal to the backward operator at its adjacent point (i.e., j + 1), the application of the fourthorder compact MacCormack method for spatial discretization of the source term in vertical momentum equation in non-hydrostatic models needs special treatment. In this work we have used the conventional second-order MacCormack method (MC2), the standard fourth-order compact MacCormack method (MC4) developed by Hixon and Turkel (2000) and a fourth-order compact MacCormack method with a four-stage Runge-Kutta for time advancing (MCRK4) in our numerical simulations. To evaluate the performance of these methods, two test cases including evolution of a warm bubble, and evolution of a cold bubble in a netural atmosphere were simulated. To simulate cold bubble, the test case presented by Straka et al. (1993) and for simulation of warm bubble, the test case of Mendea-Nunez and carrol (1993) are used. Qualitative and quantitative assessment of the results for different test cases showed the superiority of the MCRK4 and MC4 methods over the MC2 method. بیدختی، ع. ع.، بیوک، ن.، و ثقفی، م. ع.، 1383، بررسی ساختار چند جریان جستناک توفان‌های همرفتی تهران با استفاده از داده‌های سودار: مجله فیزیک زمین و فضا، 30(2)، 93-113. قادر، س.، بیدختی، ع. ع.، و فلاحت، س.، 1389، حل عددی مسئله تنظیم راسبی غیرخطی ناپایای دوبعدی با استفاده از روش فشرده مک کورمک مرتبه چهارم: مجله فیزیک زمین و فضا، 36(3)، 151-173. قادر، س.، بیدختی، ع. ع.، و فلاحت، س.، 1390، حل عددی شکل پایستار معادلات تراکم‌پذیر دوبعدی و غیرهیدروستاتیک جو با استفاده از روش مککورمک مرتبه دوم: مجله فیزیک زمین و فضا، 37(2)، 171-191. Ahmad N., and Lindeman J., 2007, Euler solution using flux-based wave decomposition: Int. J. Numer. Meth. Fluids, 54, 47–72. Carpenter, R. L., Droegemeier, K. K., Woodward, P. R., and Hane, C. E., 1990, Application of piecewise parabolic method (PPM) to meteorological modeling: Mon. Wea. Re., 118, 586–612. Carroll, J. J., Mendez-Nunez, L. R., and Tanrikulu, S., 1987, Accurate pressure gradiant calculation in hydrostatic atmospheric model: Bound-Layer Meteo., 41, 149–169. Durran, D. R., 2010, Numerical Methods for Fluid Dynamics with Applications to Geophysics: Second Edition, Springer, New York. Esfahanian, V., Ghader, S., and Mohebolhojeh, A. R., 2005, On the use of super compact scheme for spatial differencing in numerical models of the atmosphere: Q. J. Roy. Meteorl. Soc., 131, 2109–2130. Fox, L., and Goodwin, E. T., 1949, Some new method for the numerical integration of ordinary differential equation: Proc. Cambridge Phi. Soc. Math. Phys., 45, 373-388. Ghader, S., Mohebalhojeh, A. R., and Esfahanian, V., 2009, On the spectral convergence of the super compact finitedifference schemes for the f-plane shallow-water equations: Mon. Wea. Rev., 137, 2393–2406. Ghader, S., Nordström, J., 2015, High-order compact finite difference schemes for the vorticity–divergence representation of the spherical shallow water equations, Int. J. Numer. Meth. Fluids, 78, 709-738. Golshahy, H., Ghader, S., and Ahmadi-Givi, F., 2011, Accuracy assessment of the super compact and combined compact schemes for spatial differencing of a twolayer oceanic model: Presentation of linear inertia-gravity and Rossby waves: Ocean Modeling, 37, 49–63. Giraldo, F. X., and Restelli, M., 2007, A study of spectral element and discontinuous Galerkin methods for the Navier–Stokes equations in non hydrostatic mesoscale atmospheric modeling: Equation sets and test cases: J. Comput. Phys., 227, 3849–3877. Gottlieb, D., and Turkel, E., 1978, Boundary conditions for multisteps finite-difference methods for time dependent equations: J. Comput. Phy., 26, 181–196. Hixon, R., and Turkel, E., 2000, Compact implicit MacCormack–type scheme with high accuracy: J. Comput. Phys., 158, 51–70. Kreiss, H. O., and Oliger, J., 1972, Comparison of accurate methods for the integration of hyperbolic equations: Tellus, 24, 199–215. Lilly, D. K., 1962, On the numerical simulation of buoyant convection: Tellus, 14, 148–173. Lele S. K., 1992, Compact finite difference shemes with spectral-like resolution: J. Comput. Phys., 103, 16–42. Mendez-Nunez, L. R., and Carroll, J. J., 1994, Application of the MacCormack scheme to atmospheric nonhydrostatic models: Mon. Wea. Rev., 122, 984–1000. Mohebalhojeh, A. R., and Dritschel, D. G., 2007, Assessing the numerical accuracy of complex spherical shallow water flows. Mon. Wea. Rev., 135, 3876-3894. Müller, A., Behrens, J., Giraldo, F. X., Wirth, V., 2013, Comparison between adaptive and uniform discontinuous Galerkin simulations in dry 2D bubble experiments: J. Comput. Phys., 235, 371– 393. Navon, I. M., and Riphagen H. A., 1979, An implicit compact fourth-order algorithm for solving the shallow water equations in conservative-law form: Mon. Wea. Rev., 107, 1107–1127. Numerov, B. V., 1924, A method of extrapolation of perturbations: Mon. Notic. Roy. Astron. Soc., 84, 592–601. Straka, J. M., Wilhelmson, R. B., Wicker, L. J., Anderson, J. R., and Droegemeier, K. K., 1993, Numerical solutions of a nonlinear density current: A benchmark solution and comparisons: Int. J. Numer. Meth. Fluids, 17, 1–22. Tannehil, J. C., Anderson, D. A., and Pletcher R. H., 1997, Computational Fluid Mechanics and Heat Transfer: Taylor & Francis, Second edition. Yelasha, L., Müller, A., Lukáˇcová- Medvid’ováa, M., Giraldo. F. X., and Wirth, V., 2014, Adaptive discontinuous evolution Galerkin method for dry atmospheric flow: J. Comput. Phys., 268, 106–133. Zhang J., Sun H., and Zhao J. J., 2002, Highorder compact scheme with multigrid local mesh refinement procedure for convection diffusion problems: Comput. Methods Appl. Mesh. Energy, 191, 4661– 4674.